I am in love with O.P.I. 's France Collection, which includes this beautiful gray / taupe color called "You don't know Jacques!" In fact, I garnished my fingernails with this lovely color of gray this afternoon and it couldnt look more lovely. You can purchase this color at a GREAT price at SV Beauty Supply (they are usually $8 a pop, but on this site they are sold for $4.25 a bottle... a STEAL). 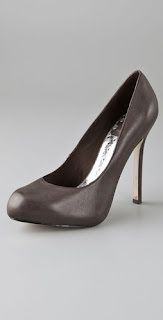 If you are in need, like I am, of some great gray pumps, these Dolce Vita pumps in Grigio Gray are for you. They are really pretty, and their price at $155 makes them even more attractive. Its time to match those drapy shirts with some spicy skirts for the holidays girls. This means YOU Kim Lee. No BOOOOOOORING black pants with your pretty black drapey sweater... you have to kick it up a notch! Especially when you are going to be in NYC for NYE. Here are some of my new found favs by Haute Hippie, Myne, Milly, A Common Thread, and M Missoni. I mean, who doesnt need a leather skirt? Jill Stuart knows that we all do.... and shopbop.com knows we need it at 30% off. I have said it before, and I'll say it again. Camilla and Marc always hit the nail on the head. I just love this dress and want to wear it to the gift exchange / holiday party I am throwing tomorrow night... but alas, this shopoholic has put herself on a not-so-camilla-and-marc friendly budget for the holidays... booo.